Actually, I’m not that cynical because although I hate the awful exploitation and the implicit exclusion of those who might not have someone special in their lives right now, I’m fully in favour of anything that helps promote a sense of loving warmth and wellbeing among us, particularly in the middle of a cold, grey February. Not to mention at this tortuous time for the nation. 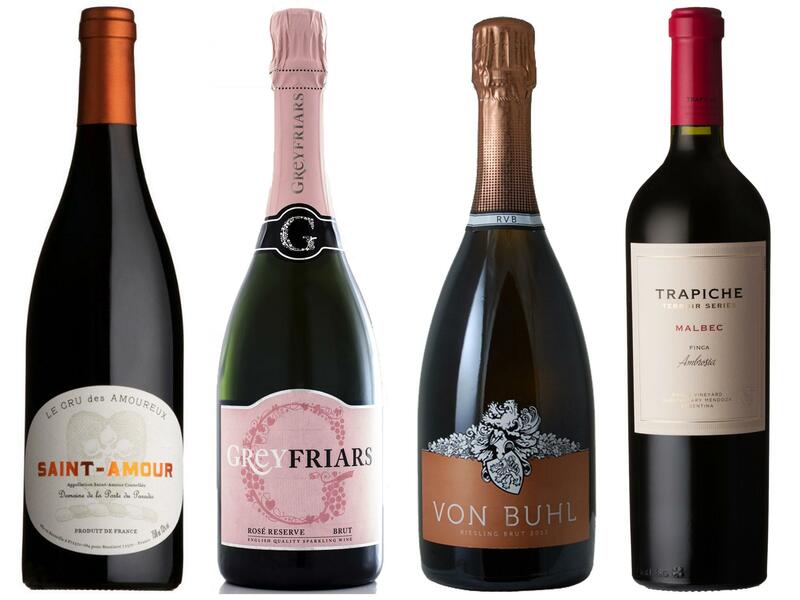 With that spirit in mind, here are some suggestions for sumptuous and elegant wines to accompany a memorable meal this Thursday or, indeed, anytime. To kick off it has to be sparkling wine, naturally. And although there are lots of timely discounts on the big names of champagne out there, I’m going with a less well known, great value buy with the Champagne Castlenau Reserve Brut (£26.99 from Click n Drink; £28.00 from The Wine Society) from the Champagne capital of Reims, which strikes a lovely balance between floral freshness and a richer, toasty, fuller mouthfeel. Great for just sipping, or while nibbling on nuts and olives, or perhaps with those oysters. The sparkling wine market has expanded so much that there are now many alternatives to champagne: French cremant, Spanish cava and the inevitable prosecco. But how about a refined German sparkling sekt, made from the elusive riesling grape? The Reichsrat von Buhl Riesling Brut 2015/2016 (2015: £21.00 from Laithwaites; 2016: £15.81 from Wine Buyers) is from an ancient German wine estate now being run by a former head winemaker from Bollinger. Made in the traditional champagne way, it delivers a rich and creamy mouthful, lifted with notes of green apples and citrus. Of course, one can’t avoid the pink thing on Valentine’s Day and so, if we really must, I’ve chosen a very fine English sparkling rose, the Greyfriars Rose Reserve Brut (£21.00 from Greyfriars Vineyard; £25.99 from Waitrose) from an established vineyard on the North Downs near Guildford under new ownership since 2010 and producing some sensational sparkling wines. The rose, which took the International Wines and Spirit Competition gold award in 2018, is 90 per cent pinot noir, 10 per cent pinot meunier and therefore packed with slightly spicy, red berry fruits. Ideal with smoked salmon, crab or lobster. Staying with pink (and although I firmly believe rose is a wine for summer months, I also know a nicely bottled, refreshing pink can be a lovely thing at a special meal), the La Terrasse Rose Pays D’Oc (£8.00 from Sainsbury’s) by the remarkable southern France specialist Domaines Paul Mas does fit the bill: a typical cinsault, grenache, syrah blend: very dry, slightly spicy and orange peel-scented and is one for fishy canapes, crustaceans or anything involving tomatoes. For proper fish, say a salt-baked sea bass, roast John Dory or pan-fried hake steak, as well as oysters, a fine French white is what is needed. Try the Chablis Premier Cru Simonnet Febvre Vaillon 2015 (£28.99 from Waitrose) which exudes refinement and class: pristine structure, bracing minerality, vibrant stone fruits, lengthy on the palate. Now for two contrasting reds: for lighter main course dishes like chicken or perhaps a vegetable dish like a tagine or paella, then the wines of Saint-Amour in the Beaujolais Villages are a good choice and not only for the appropriateness of the name: the Chateau de Belleverne St Amour Le Cru de Amoureux 2017 (£9.99 from All About Wine; £10.29 from Rannoch Scott) is typical of the richer Beaujolais style: elegant, velvety and supple, but with an underlying, subtle, earthy note that is quite beguiling. This wine is substantial and weighty enough to work with red meats as well, but if it is perhaps a Chateaubriand or a choice cut of lamb, some may wish to opt for a big Malbec from Argentina. The Trapiche Terroir Series Malbec Finca Ambrosia 2014/2015 (2014: £30.99 from Mumbles Fine Wines; 2015: £29.99 from Amazon; £32.50 from Great Western Wine) is multi-layered and luxurious, with notes of smoke, herbs, tar, liquorice and intense flavours of dark fruits with a long, long finish. The 2014 is another IWSC gold medal winner. Finally, a great meal needs a terrific dessert and a fabulous dessert wine to round it off. The Noe 30-Year Old Pedro Ximenez Viejo (£19.00 from Ocado; £20.95 from The Whisky exchange) made from sundried Pedro Ximenez grapes is warming, sweet, exotic gorgeousness from the sherry triangle of southern Spain. Luscious, viscous and intense, the flavours of caramel, coffee and dark fruits linger on forever. Great for all sweet desserts, particularly chocolate, or just poured over vanilla ice cream for a suitably decadent moment to end a special meal.